In the early Anglo-Saxon period, the region of Great Britain known as Northumbria was a kingdom in its own right. These lands, in what is now northern England and southeast Scotland, were the targets of the first Viking raids on Britain. This violent influx, followed by the establishment of trade routes with the Norse, brought the runes to the region, where they intermingled with local magical traditions and legends, resulting in the development of a practical runic wisdom entirely unique to Northumbria. 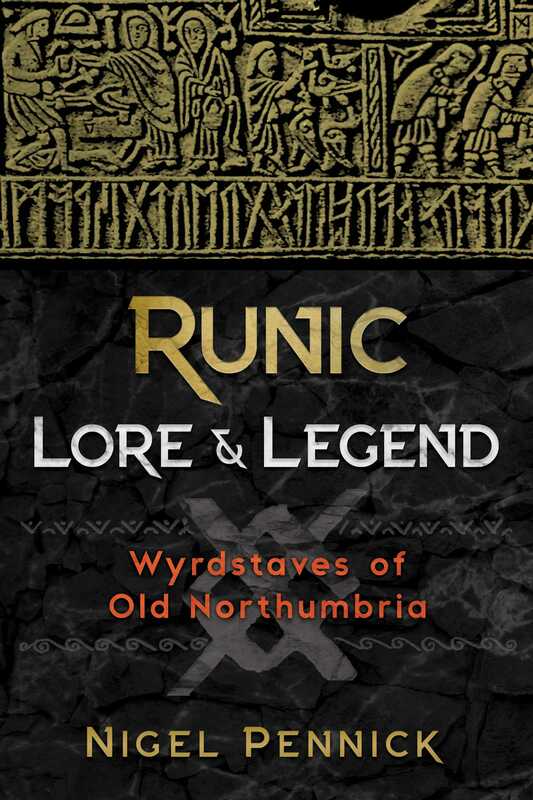 In this guide to the Wyrdstaves, or runic practices, of Old Northumbria, Nigel Pennick examines the thirty-three runes of the Anglo-Saxon Futhark and how they were used in Old England for weaving the web of Wyrd. Sharing runic lore and legends from the area, he explains how the Northumbrian runes are unique because they contain elements from all the cultures of the region, including the Picts, Britons, Romans, Angles, Scots, and Norse. He illustrates how each rune in this tradition is a storehouse of ancient knowledge, detailing the meanings, historical uses, symbolism, and related tree and plant spirits for each of the thirty-three runes. The author describes the Northumbrian use of runes in magic and encryption and explores geomancy divination practices, the role of sacred numbers, and the power of the eight airts, or directions. He also shows how the Northumbrian runes have a close relationship with Ogam, the tree alphabet of the ancient Celts. Providing a magical history of Northumbria, as well as a look at the otherworldly beings who call these lands home, including boggarts, brownies, and dragons, Pennick explains how traditional spirituality is intimately tied to the landscape and the cycle of the seasons. He reveals how the runic tradition is still vibrantly alive in this area and ready for us to reawaken to it. Icons of the goddess Frigg, Queen of Heaven, portray her with a distaff and spindle, or riding on a distaff in the manner of a witch on a broomstick. Northern Tradition astronomy calls the starry heavens Frigg’s Cloak. The spindle with which she spins is the North Star, Polaris, while her distaff is marked by the three stars called the Belt of Orion in Graeco-Arabic astronomy. This image of the divine spinner is reflected in Christian images of the annunciation, which depict Mary spinning with a spindle and, beside her, a woven wickerwork basket containing wool. Although connected with the story of Jesus, the weaving of destiny by the woman who enables new human life to come into the world does not originate in Judaeo-Christian tradition. It is present in Greek and Roman cosmology where three sisters representing the past, the present, and the future are shown participating in the three stages of weaving. The first spins the thread from the raw materials. The second weaves the various threads spun by the first into a fabric, and the third cuts or rips the fabric apart. In England, these are the Weird Sisters, and the fabric woven by the middle one is the Web of Wyrd. Telling of the Weird Sisters, whom the Norse call the Nornir, the Icelandic poem Voluspá recounts that they “staves did cut, laws did they make, lives did they choose: for the children of men they marked their fates.” The Norns have a name that is interpreted as “those who speak,” being related to the Middle English verb nurnen, “to say.” Their utterances or decrees are expressed in the language of runic writing, the Old English words stafir and stafas, “staves.” Staves can mean both runic characters and the wooden staves upon which they are cut. The runes are integral with fate and record: the Old English word wyrdstafas refers to the decrees of fate, and endestafas is death. But whatever happens to us is the result of how we act within the conditions we find ourselves, for we have free will within our circumstances. We are within the given circumstances and must endure their difficulties, but how we endure them and how we deal with our circumstances is up to us. Fate works in accordance with nature; all things that come to individuals are neither rewards nor punishments sent by the gods, but they are the inevitable consequences of actions. The runes are fundamental to understanding something of the weavings of the Web of Wyrd. At the present day the common view concerning alphabets, other than taking writing and reading for granted, is that they are solely practical in character. They are considered as functional necessities that are required for written communication and the conduct of everyday life. The possibility that there may exist within them some deeper significance rarely emerges into commonplace awareness. But if we begin to penetrate beneath appearances, we enter the realm of many concepts and connections, which demonstrate the basic unity of life that is the Web of Wyrd. For in the use of characters to represent sounds and numbers we penetrate the mysteries that lie at the foundations of existence. Alphabets are derived from pictograms and glyphs that stand for actual things or actions as well as phonetic sounds. The modern Western alphabets of Hebrew, Greek, Latin, Cyrillic, and Arabic owe their source to an ancient Canaanite script that developed into two major versions: Phoenician and Aramaic. Alphabets to the east of Syria were derived from the Aramaic, while those to the west, from Phoenician. Hence the ancient alphabets of Europe--including Etruscan, Oscan, the various forms of Runic, Gothic, Church Slavonic, the Aibítir of Gaelic, and the Coelbren y Beirdd of Wales--are all derived ultimately from the Phoenician script of 3,000 years ago. The runes have a special place in the European Tradition. The alphabetic glyphs we call runes are what appear in the mind when the word rune is heard. But a rune is not just a letter of an alphabet; it can be a song, an incantation, or an invocation as well as a glyph pregnant with symbolic meaning either as an alphabetic letter, an idogram, or a symbol, in some cases all at the same time. So a rune is more than just a letter in an ancient alphabet. Its actual meaning, raunen, in Old English run and in Middle Welsh rhin, was “mystery.” This meaning tells us that within the simple figure, composed of a few lines, lies a great deal more than its surface appearance. An authority on ancient belief systems, traditions, runes, and geomancy, Nigel Pennick is the author of several books, including The Sacred World of the Celts, Secret Games of the Gods, and The Ancient Science of Geomancy. He lives near Cambridge, England, where he follows the oral tradition and Pagan lore of his native East Anglia.